It’s been a long time coming, I’ve wanted to feature our good friend and maker Jonathan Leech for a little while but for some reason it’s taken longer than I would have liked. So it gives me great pleasure to showcase this fantastic wood turner and give you an insight in to his working methods and general thoughts as a creative. As you’ll read below, we discuss his decision to turn craft in to a career, Jonathan’s thoughts on mass production, and his strong link with the National Trust in the UK. Overall you’re sure to find some inspiring words that you could tie in to your own creative quest, and view some great objects that are all made with quality and longevity in mind. 1. Who is Jonathan Leech and what does he do? 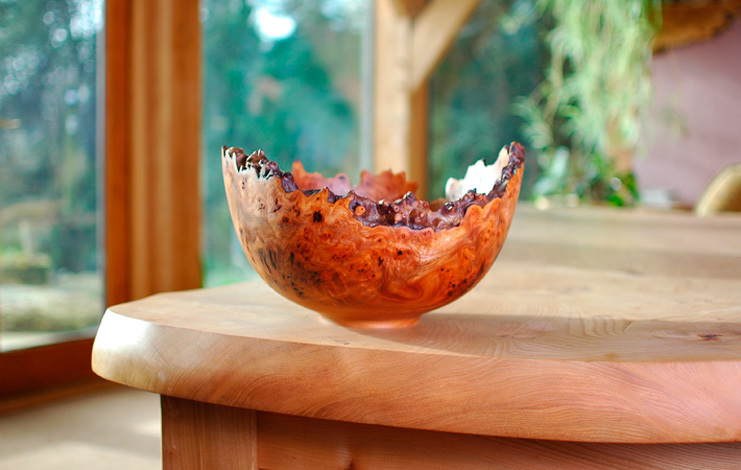 Jonathan Leech is a full time wood turner and makes bespoke artistic pieces from locally sourced timber. 2. How did you come to the decision of turning a craft into a career? I have always dreamed of having a craft based career. The creative process is a vital part of my life and something which gives me immense fulfillment – I don’t think a more regular form of employment would have motivated me in the same way. Work seems to have the ability of sapping all my energy, or leaving me bored – I have not yet found an in between! 3. For some unknown reason it seems like those working within creative careers constantly have to justify what they do, unlike other types of professions. Is this something that you’ve felt yourself previously, and if so how do you personally overcome this obstacle? This is something I have felt on quite a few occasions! The creative career path is a strange one for me, since it revolves around my ability to make pieces, which I perceive to be artistic and beautiful. My success depends on a certain amount of self confidence and belief that I am making items which will be desired. If things don’t go quite to plan, I nearly always question myself. This can have the potential of being quite an obstacle at times. My solution usually comes from unrelated activities, such as cycling, walking or photography. A few days spent doing something different reinvigorates me and puts me back in the driving seat. 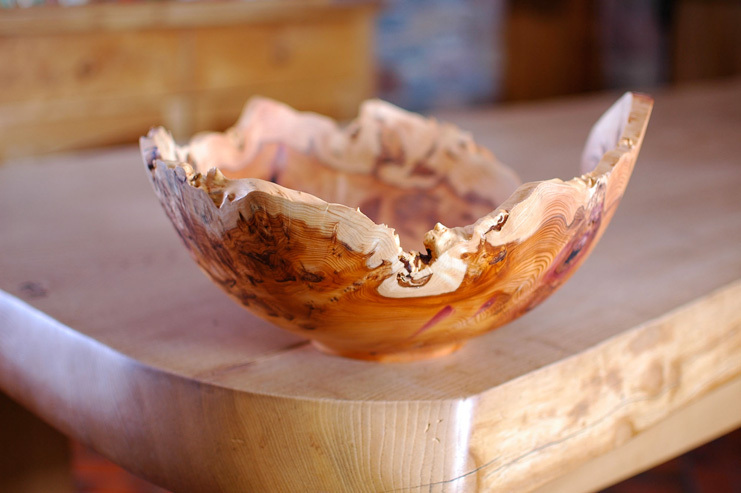 Turned from a piece of yew, this bowl with its dark orange heartwood and distinctive pale sap wood will compliment any table. 4. Of course mass produced objects have their place, but why do you believe there is real value in an object that has been made completely by hand? For me, it is the quality and pleasure of ownership. Quality is not just a measure of how something is made, but is also a measure of its impact – the way a shape catches your eye, or the feel of a surface which has been finished totally by hand, be it wood, ceramics, or even metal. The idea that it is possible to own and experience something totally unique, is I believe, of immense value and importance. 5. We’ve spoken previously about the many woodturners out there with ample talent yet little online presence, which is a bit of a shame. From your own experience how much of a difference has investing in the web made to your business and why should others make the jump to showcasing online? For me the difference has been dramatic. Like many craftspeople in my local area, I started off by attending regional shows and craft fairs – often on a weekly basis. However, about two or three years ago, I noticed a pattern in the way people began spending their money. Direct selling to the public had always presented problems for me. The pieces I make are bespoke items and didn’t always fit in with other produce available on the high street. It seemed as though customers who wanted a bespoke gift would contact me through word of mouth and those looking for a bargain would visit my market stall! I was aware the internet was gaining importance, so decided it would be interesting to see how a website would affect my sales. I launched the website in February 2011 and have never looked back. For me, the main benefit is that customers approach my site, already looking for a wooden gift – this is a huge advantage. Selling online accounts for about 75% of my sales, and this figure is increasing. For anyone who has a product, which can be easily packaged and posted, the internet is well worth investigating as a means of increasing sales. I find there is a lot of work involved with maintaining and updating the website, but this is well worth it in the end. A very large piece of Cumbrian burr which features a full natural edge and beautiful colours. 6. It’s great seeing you experiment with larger creations on the lathe through your blog, does this ever give you aspirations to create even larger projects, perhaps sculptures away from the lathe? Yes, most certainly. I have always liked the idea of incorporating carving, or other methods into my work. I think there is a possibility of me making more sculptural pieces in the future – maybe involving both carving and turning. The lathe I use has the ability to hold and spin up to half a ton in weight! I can safely say my machinery is future proof – the only restriction at present is my own ability to create. 7. How did your relationship with the National Trust develop and what does this typically involve? I was approached by the National Trust in 2010, shortly after the severe flooding which affected most of North Cumbria. The gardens of Wordsworth House in Cockermouth had been devastated and unfortunately, some of the trees had to be felled. These would have been young saplings at the time William Wordsworth was living in the house. I worked with the National Trust to design a range of gifts, which could be made from the salvaged timber. These were sold as mementos of the old gardens and proved to be very popular. Since then, I have supplied many of their outlets with a wide range of my work. Some of the larger National Trust shops, such as the visitor center at Sizergh Castle, are becoming more like galleries. Local crafts are starting to replace the more generic gifts, which will be great for me in the future. A yew tree that’s ready to be processed, i.e. 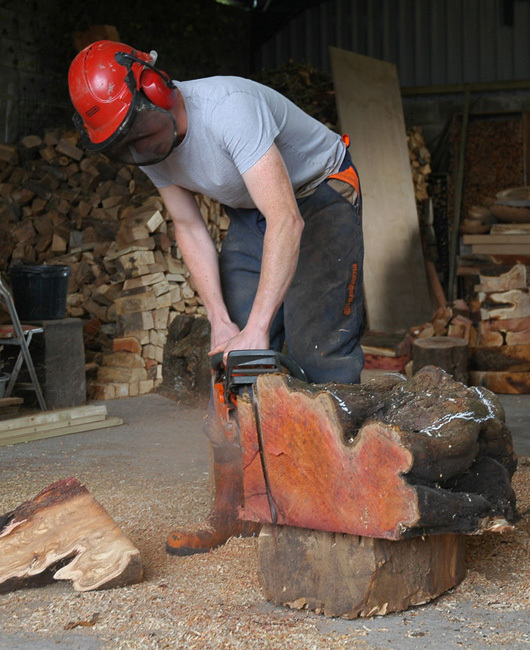 cut in to sizeable pieces so Jonathan can turn wooden forms and objects out of them. 8. Personally I’d love to see a short film documenting more about you and the work you undertake in the studio. Is this something you’ve ever considered, and aside from this idea how important do you believe it is to highlight the hard graft behind your finalised creations? I’ll soon be adding some video to my blog and hope to illustrate all of the processes. I think people only ever understand the true value of a product when they see all the work involved. 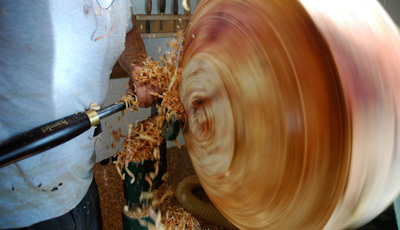 The final turning of a bowl can sometimes represent only a quarter of the overall ‘making time’. 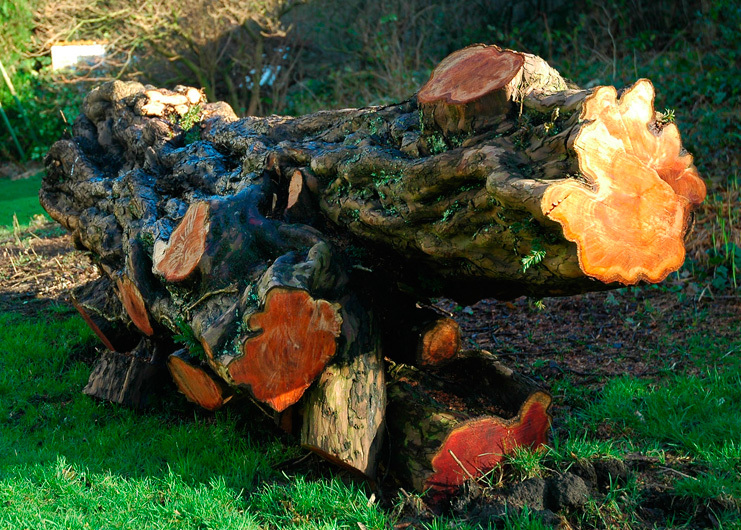 There is a lot of graft involved – dragging a tree stump across a muddy field and chain sawing timber all day, in rather typical Cumbrian weather conditions, are just a few of the jobs I regularly undertake. When this is depicted, it becomes easier to understand the value of the pieces I make. 9. What would you say is your biggest influence? Is there a particular woodturner you look up to or a designer / maker that you admire? About five years ago, I attended a course ran by world renown woodturner, Tracey Owen. Tracey has had a huge influence on what I make today – especially when it comes to large natural edge pieces. He has an incredible amount of talent. Tracey is famous for using texturing techniques on the outside of bowls and platters. He has designed his own tools for doing this, which are available for the woodturner to buy. He also uses heat to darken the timber – this is something I hope to try in the future. 10. Can you describe to us the career path you took and is this one you would recommend to someone else wanting to take up something similar? My career path has been an interesting one, to say the least! I trained as a scientific illustrator, but then worked in the cycle trade for several years. I discovered woodturning by chance, after meeting the owner of a local furniture making company. I certainly didn’t start from school – in fact, I didn’t pick up a chisel until I was nearly 30! I think motivation is the most important factor. Sure, my career path wasn’t an obvious one, but having the desire to achieve is what has kept me going. All I can suggest is that everyone has the ability of achieving what they want to do. Sometimes, a rather irregular path can give you experience in other areas, which will be of extra help in the end. 11. 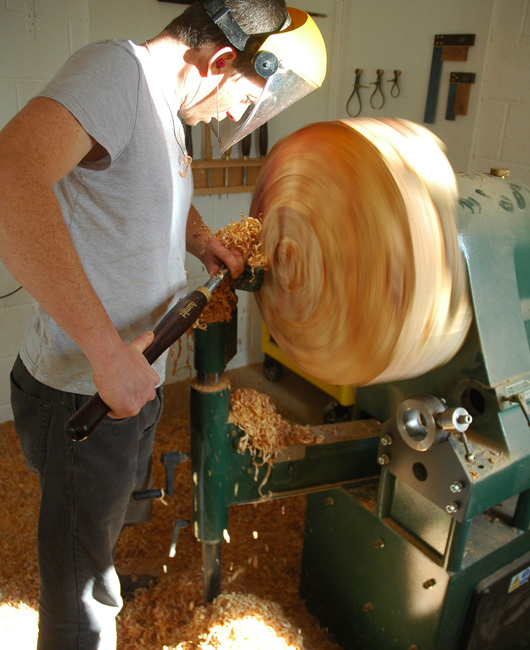 For those of us who aren’t familiar with woodturning, how would you describe the process and what does this entail? I start off by sourcing the timber. This usually involves cutting up a tree trunk, or branch into manageable pieces. These are then cut into thick slabs and then sawn into circular discs on a bandsaw. The discs are then fastened to the lathe and spun at a slowish speed – they will be full of natural sap at this stage and very heavy. I use a gouge to rough turn the outside of the disc into the underside shape of a bowl. This is then turned around and the inside is hollowed out. These are referred to as ‘blanks’. They are thicker than a normal bowl and are left to dry out and distort for between six months and three years, depending on size. Once they are dry, they are returned to the lathe for the final stage. I spin them again, quite slowly – this time they are distorted and out of balance. I use the same tools to true them up and turn them to their final shape. At this point, I begin sanding the surfaces with a drill mounted sander. I use a natural shellac based sanding sealer between grades of sandpaper and this helps me get a very smooth finish. Finally, I remove the bowl from the lathe and hand finish the base underneath. I will then apply a coat of oil and allow the bowl to dry. 12. What would you say are your long-term goals and how ambitious are you with your craft? I would like to focus on larger, more artistic pieces if I can – especially those with natural edges. I think this is certainly the way I would like my craft to evolve. I have not yet hosted any solo exhibitions, but hope to do this in the future. I’d love to supply some of the top galleries with my largest pieces and work more to commission. I guess the next step forward will be teaching. I will be doing some this winter and may aim to do more in the future. 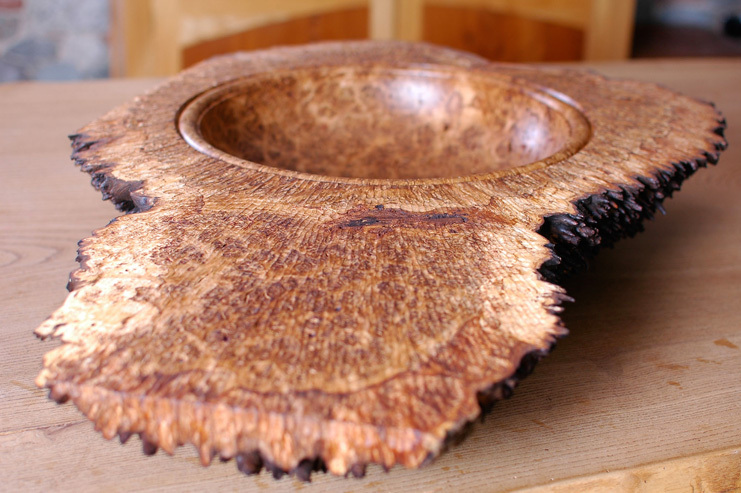 A carved burr oak bowl. Notice how Jonathan leaves a lot of the tree intact when carving. 13. Have you got used to the notion of your work being placed into the homes of others, hundred of thousands of miles away from your studio where they’re made. We’ve shipped your pieces as far as California and Japan previously, this must be satisfying for you as an artist? I still find it hard to believe that my work has been shipped so far! It’s incredibly satisfying to know that little (and sometimes large) pieces of Cumbrian wood will be sitting on tables across the world. The power of the internet is amazing – quite how someone in California ends up purchasing one of my pieces, still continues to astound me. 14. What can we expect from yourself in the near future, do you have any fresh projects or ideas that you can tell us about? I’m planning to make some large hollow form piece this year – very similar in shape to a vase, but with interesting natural edges and other features. I’m also toying with the idea of making a bespoke range of bathroom sinks. I will have to employ new methods of finishing, but know a couple of local boat builders, who may be able to assist! I plan to develop my spindle turning technique, so may be introducing some small furniture pieces to my range, such as stools, for example. 15. Finally, do you have any words of advice to offer us that has been useful to you in your experience thus far? I’ve learnt to forget my mistakes and remember my achievements. This sounds like the obvious cliché, but is so important for my ability to progress. I try to be as understanding and helpful as I can when communicating with my customers. Someone who persists on giving you a hard time will always recommend you if they are happy with the service – even if it seems unlikely from the start. The most important thing however, is to be motivated – every problem you encounter will have a solution, it’s just a case of finding it.